Use the form below to inquire about Traditional Estate Stay At Manjelparappu . Use the form below to reserve for Traditional Estate Stay At Manjelparappu . This traditional Estate Stay at Manjelparappu forms the crux of the residence amidst the grand Palani Hills at Dindigul. If you want to experience the feeling of being reborn, this Traditional Estate Stay at Manjelparappu is the place to be. Reflecting renaissance, this astounding architectural piece was twice pulled down, moved, and remodeled. The estate, a small garden hotel, has 7 unique bedrooms. With their 18th century décor, the bedrooms are not only spacious and have en-suite bathrooms, but are extremely comfortable. An extra bed for a child is also provided on request. The highly private bedrooms can be reached only through the center courtyard. There is also easy connectivity to the garden from every room. The beds are cozy with charming cotton sheets, opulent quilts, and smooth pillows. Estate Stay at Manjelparappu is the world in itself and is dotted with lush forests, coffee estates, and the grand Palani Hills. True to its essence, the cuisine is primarily from south India and has a touch of Mediterranean flavor. The estate houses its own farm which is the main source of kitchen supplies. The hotel lets you pick either Indian or continental fare for breakfast and there are daily changes to the menu for dinner which comprises of appetizers, main course, and desserts. Freshly ground coffee and tea service at any time is another great plus. Apart from regular lunch, picnic lunches are provided for treks on request. 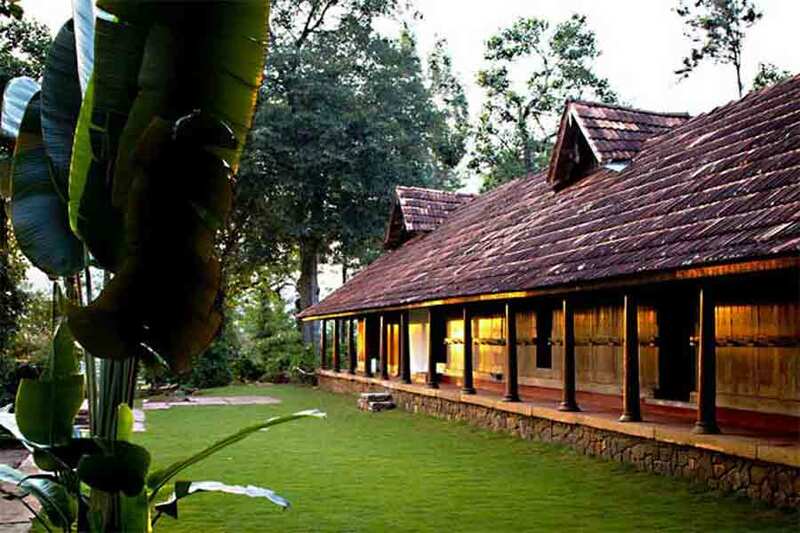 The Estate Stay at Manjelparappu is a fine example of Kerala’s building traditions. This hotel is a strong reminder of an ancient architectural marvel. The black oxide floors contrasting with the wooden structure give the building a stunning visual appeal. A stay at this Traditional Estate Stay at Manjelparappu which is situated 3,500 meters above sea level, is a mesmerizing journey to the hills of South India. It exposes you to a lifestyle in a very different environment. With birds chirping in the background, spend time on the terrace, in the garden, or o under the shade of a tree reading in a hammock. Rates are inclusive of Lunch, Dinner, Breakfast, Anytime tea or coffee. All prices are subject to 20.9% government tax. Service charge not included - tips at the discretion of guests into the tip box at the end of the stay. Balance 45 days before date of stay. 45 days before check-in: Full refund minus bank charges. 45 to 30 days before check-in, 75% refund. 30 days to the date of check-in, no refund. In case of early check out, refund is not possible. The climate at Dindigul is pleasant all year round and therefore this Estate Stay has a number of excursions to offer guests. Whether it is a walk up to the river or through rocky gorges, a visit to the nearby coffee plantations or waterfalls on hills, a walk in the wild woods or a swim in quiet pools, the excursions are accompanied by an estate guide. The excursions to Kodaikanal, Madurai, and Palani, can also be easily planned. Picnics too can be arranged to the nearby places. Life here is laid-back and has not changed much, offering you a refreshing opportunity to explore surrounding villages, local rituals, and temple festivities. The estate is also home to over 200 migratory and indigenous bird species. Dindigul is 242 km (5 hrs 15 mins) from Ooty, 433 km (app 7 hrs) away from Chennai, and 414 km (app 7 hrs) away from Hosur, Bangalore. Take Hosur road and drive towards Krishnagiri-Dharmapuri and then from Dharmapuri drive towards Namakal-Karur. On reaching Karur drive towards Aravakuruchi-Jangalpatti-Vedasandur-Thadikombu and reach Dindigul. On reaching Dindigul drive 44 km (app 1 hr 15 mins) towards Sithayankottai and turn left onto Manjelparappu Road to reach the estate. The closest airports to Dindigul are Madurai and Tiruchirapalli which are situated 84 km (1 hr 20 mins) and 100 km (1 hr 30 mins) away. The nearest railway station is 44 km away (app 1 hr 20 mins) from the estate at Dindigul and is an important stop on the Chennai main route that heads down to the southern peninsular part of India. The bus station is at Dindigul too, a 44-km drive (1 hr 20 mins) from this traditional Estate.